Pulgini & Norton offers dedicated representation to individuals bringing claims arising from job-related accidents. For decades, our workers’ compensation lawyers have asserted the rights of employees injured in the workplace. If you sustained a job-related accident or illness, a Boston office injury lawyer can discuss whether you are eligible for benefits and help you in the appeals process if your claim has been denied. 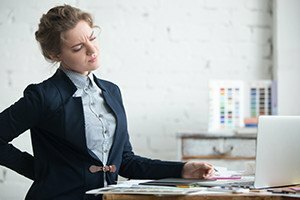 Manual labor is often considered more hazardous than working in an office or professional setting, but office workers can also suffer injuries or illnesses as a result of their work environment. According to the Massachusetts 2012 Occupational Injuries and Illnesses Report, there were 3,000 cases in which employees in professional and business services had to take time off from work because of a job-related injury or illness. Another 500 individuals needed a job transfer or had their duties restricted. Slips, trips, and falls – A worker can slip and fall on an uneven or wet floor, in a dark hallway, or over power cords or other items left on the ground. Overexertion and other physical reactions – A worker can have a physical reaction to a particular type of movement, such as bending or lifting a heavy object in the office. Repetitive stress injury – Long-term stress on a body part can cause serious or debilitating injuries. Prolonged sitting and lack of proper ergonomic support, for instance, often lead to nerve damage and muscle strain. Anxiety, depression, or stress – A worker may suffer disabling episodes of anxiety or stress if a specific event or series of job-related incidents contributed to the illness. If you have a workplace injury, you may qualify for workers’ compensation benefits. Employers must carry this type of insurance in the event that an employee suffers an accident or illness caused by the job. The insurance provides medical, wage, disfigurement, and other benefits to eligible workers. The extent of your injury or illness, and your ability to return to work afterward, will determine the type of benefits you can receive and for how long. When you become injured, your employer will report the incident to its insurer, which will then investigate your claim and decide whether you qualify for benefits. An insurer can pay you benefits for up to 180 days without making a final decision on your claim. If the insurer denies your claim, you can initiate the appeals process with the Department of Industrial Accidents (DIA). An insurer may deny your claim if it believes that your disability is the result of a pre-existing condition, or that another party is responsible for causing it. An insurer may deny or try to reduce your benefits if you have a pre-existing condition, which is an injury or illness that predates your current disability. Pre-existing conditions can aggravate a work injury, and you may be entitled to benefits even if you have an existing medical problem. You can only receive benefits to the extent that your job worsened the condition, but not for the pre-existing condition itself. You may have a claim against a third party if it caused your injury. A property owner, for instance, or a product manufacturer may be responsible for the harm. You can file a personal injury lawsuit against a third party and potentially recover compensation for your medical costs, lost wages, and other damages. If you also have a workers’ compensation claim pending, and your employer’s insurer offers to settle the claim, you should present your third-party action along with the settlement offer before the DIA judge overseeing your case. This will ensure that the judge considers the third-party action when he or she determines the fairness of the insurer’s settlement offer. At Pulgini & Norton, we are dedicated to providing meticulous client service and representation to injured workers. Our workplace accident attorneys have extensive experience advising and representing individuals with various types of job-related conditions. Our clients often come from Quincy, Andover, and Somerville, as well as other communities throughout Massachusetts. Call our office at 781-843-2200 or contact us online to schedule a consultation with a workers’ compensation attorney in Boston.